Sometimes events are moved, cancelled, or added during the convention. We will try to keep you informed of changes as they occur, but the best way to stay up-to-date is to download the Guidebook app at https://guidebook.com/g/NWC40 It's easy to use and allows you to set reminders for upcoming events! Learn a New Thing! We have Workshops! There are tons of things to learn this year with our new workshop series that includes several writing and publishing workshops, Glass Fusing, Victorian Ribbon Flowers, and Make Your Own Buttons. Advance sign-up is required, so go to Cascade 1 and add your name! If You're Reading This, it's Probably Too Late! Grab your morning bagel and OJ, then head quickly down to Grand 3 for Keith and Alan's Movie News and Previews, starting at 10:00 a.m. Biggest picture, biggest sound, and big egos galore! So much genre stuff to talk about; movies, TV, theme parks, the whole gamut. Grab your seat early for all the latest! And filling the void in your hearts - and Burlesque's halftime -- PDX BROADSIDES, with a special sneak peek-mini-show! The official hashtag for this year is #nwc40 — if you're posting text, photos or videos to social media just about anywhere (Twitter, Instagram, Facebook, YouTube, etc. ), please use the #nwc40 hashtag! We'll be doing our best to track those posts wherever they pop up, both during the convention to see what all of you are enjoying, and afterwords for our annual post-con roundup of con experience posts. We'll be peeking at some of the other likely used tags as well (#Norwescon, #norwescon40, and so on), but #nwc40 is the one most likely to get your post noticed. No smartphone? Guidebook is also available online! Just go to www.guidebook.com and click on FIND A GUIDE then type Norwescon in the box. Select the Norwescon 40 icon and then scroll down to the AVAILABLE ON THESE PLATFORMS section. Then click WEB! Not exactly easy, but it's there. 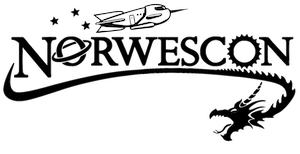 As the weekend unfolds we know you'll see things about Norwescon you like, don't like, or want to suggest. Don't keep it in! Just fill out one of our Comments Cards (there is one in your Registration Packet). Bring it to the Information Desk or the Con Office, or check the back of the card for other ways to contact us. Do you want to contribute to the Daily 'Zine? Send any ideas, requests, or suggestions to zine@norwescon.org. All items must be received before 9:00 p.m. to be considered for the next day. There are readings all day long (including some by our Guests of Honor) so drop in and listen to our amazing authors as they read short stories or excerpts from their novels. You might find a new writer to add to your favorites! Cheryl Dyson, “Norwescon 40 Daily Zine (Friday),” Norwescon History, accessed April 19, 2019, http://history.norwescon.org/items/show/372.